This article is a short summary of Kirby's Dream Land 2. 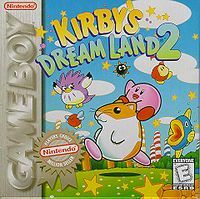 Kirby's Dream Land 2 is a game in the Kirby series, released for the Game Boy in 1995. Like numerous other Game Boy games of its time, the game contains support for the special features of the Super Game Boy, and can be played with pre-defined palettes and a custom screen border using this adapter. "The Rainbow Bridges have disappeared! Help Kirby solve the mystery. Search the seven Rainbow Islands while battling King DeDeDe and his horde of evil minions! Meet Rick the Hamster, Kine the Fish and Coo the Owl. Each holds important abilities that can multiply the magnitude of Kirby's powers. Earn the mysterious Rainbow Sword and prepare to face Kirby's most menacing rival ever - the evil Dark Matter!" The evil Dark Matter has stolen all the rainbows connecting the Rainbow Islands of Dream Land and is mind-controlling King Dedede to do his bidding. In order to return the rainbows and free the islands, Kirby must collect the seven Rainbow Drops to obtain the Rainbow Sword, the only effective weapon against Dark Matter, and face Dedede and the force that is controlling him at Dark Castle. Like other platformers in the Kirby series, the game centres around the pink puffball Kirby, who is able to inhale his enemies and spit them out at other foes to deal damage. Returning from Kirby's Adventure is the ability to swallow enemies, gaining their powers. New to this game are Kirby's Animal Friends - Rick, Coo and Kine - who the hero may rescue from mini-bosses and team up with to combine the friend's natural skills with his own ability, resulting in a new power. The game is divided into seven levels, each with three to seven stages; levels and stages must be played in a linear order, each stage or level unlocking the next one upon completion. A simple world map and seven individual, side-scrolling level maps are used to access stages; previously beaten ones can be revisited on the map and replayed at any time. At the end of every level, Kirby faces a boss, which is stronger than other opponents in the game and possesses a great amount of health that Kirby must take down using his unique abilities. Unlike other stages, most boss stages cannot be revisited and are instead replaced by mini-games, which enable Kirby to acquire extra lives. Each of the game's levels has a Rainbow Drop hidden in one of its stages, which can only be obtained by using a specific ability or combination of an ability and an Animal Friend. While it is possible to "finish" the game without collecting these, they are required in order to fight Dark Matter, see the true ending and achieve 100% completion. This page was last edited on 19 November 2017, at 06:13.